Young students play in the ruins of the Aal Okab school, destroyed during the conflict in June 2015. Students now attend lesson in UNICEF tents nearby. Saada City, Yemen. 24 April 2017. “The time has come to begin a new process, to relaunch a process which will lead to a resolution to this conflict, which has so tragically marked the life of so many Yemenis and continues to do so,” he told journalists. Speaking at UN Headquarters in the Swiss city, the veteran diplomat noted that it had been “two years; two years too long” since the belligerents had last met to discuss a peaceful end to the brutal conflict, whose roots date back to uprisings in 2011. 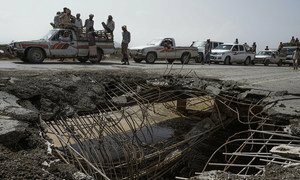 Fighting in Yemen escalated in March 2015, when an international coalition led by Saudi Arabia intervened militarily at the request of Yemen’s President against “Houthi-Saleh” opposition forces – a reference to the now deceased former Yemeni President, Ali Abdallah Saleh. Since then, thousands of civilians have died and around eight million are on the brink of famine, UN humanitarian agencies report. According to UN Children’s Fund, UNICEF, 76 youngsters have been killed in the war-torn country in July and August alone. Although he was reluctant to share details of the agenda for the Geneva Consultations on Yemen, the Special Envoy explained that the aim of these meetings was “to lay the groundwork” for formal negotiations to be held at a future date. He added that the initial focus should be on building confidence between the parties. By way of an example, Mr. Griffiths explained that the mass cholera vaccination programme carried out in Hudaydah governorate in recent weeks, had been shown to deliver “tangible benefits” to the people of Yemen. Other trust-building measures will be explored in coming days, he added, including the issue of prisoner release “at scale” - something that both sides had been keen to see happen. Asked about possible interference in the consultative process by other regional powers, Mr. Griffiths said he was guided by UN Security Council resolutions on Yemen. Earlier in the day in New York, the UN Security Council members expressed their “full support” for the consultations to bring about a political settlement. 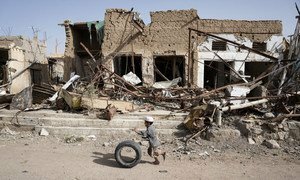 “There can only be a political solution to the conflict in Yemen,” the members of the Council said in a Press Statement, which reiterated their call for full implementation of Security Council resolutions and statements, including Resolution 2216 of 2015. 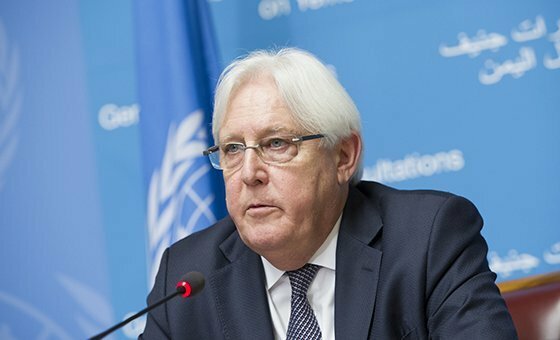 Back in Geneva, the UN Special Envoy insisted that the politics of Yemen was a matter for the Yemenis and the Council’s resolutions all pointed “in the direction of the reconstitution of the Yemeni state, based on an inclusive political settlement”.